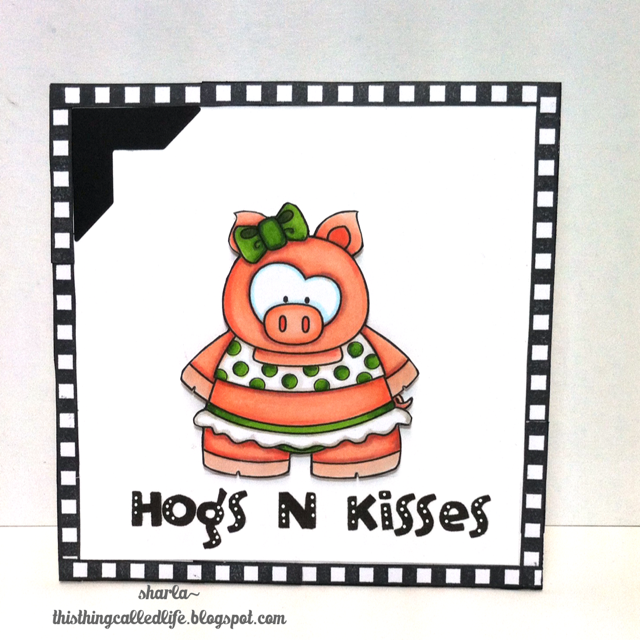 Look how cute these pigs are from Whimsie Doodles! 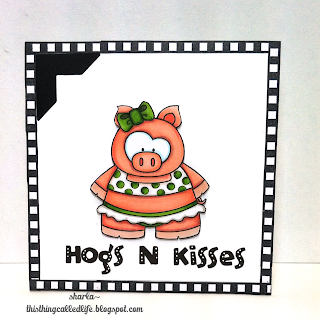 I love this cute little piggy couple. I put them each on their own card, with their own theme and went with a smaller size. The card base is 4 1/4 x 4 1/4 and I kept them as CAS as I could. I colored her with copics using R000, 01, 02, 11, 22, her suit and bow are YG03, 25, 29, and W1, 3 for shading. The border is a stamp that I stamped the image about six times and pieced them together to fit the edges, printed out the sentiment and the dots are a white sharpie....first time I've used one and I LOVE it!! Photo corner is a die that is so old I can't remember the brand. Great unusual card. Thank you so much for entering the CAS challenge over at Digi Choosday. This is beautiful..Lovely make. Love that piggy. Thank you for sharing with us at Digi Choosday. Thank you for joining our challenge this time at Digi Choosday.